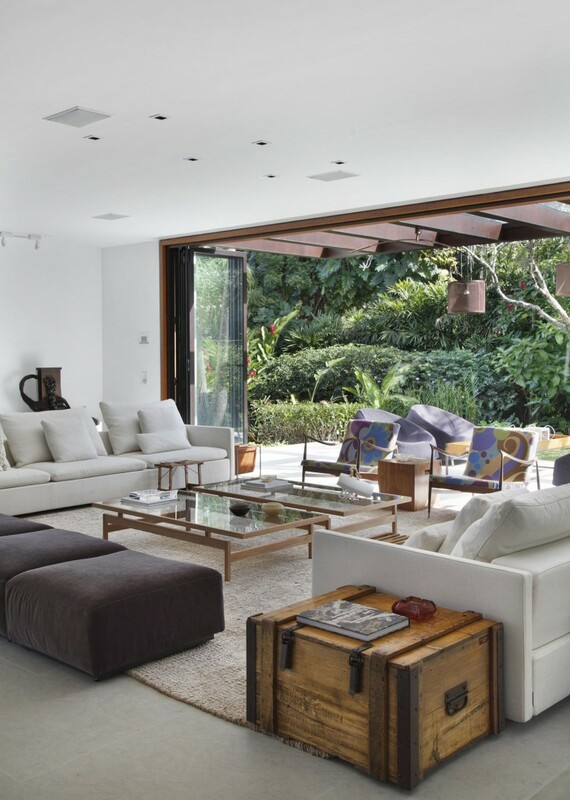 The Tempo House, located in Rio de Janeiro, Brazil, was designed by the Gisele Taranto Arquitetura studio. 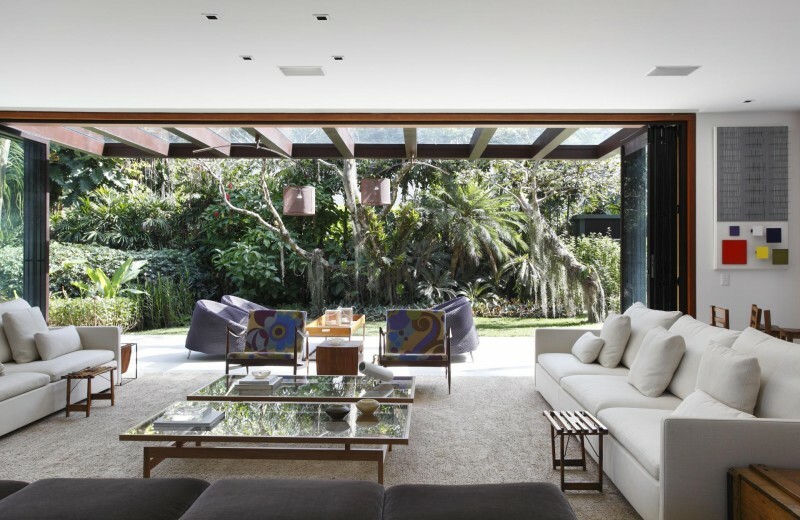 It is wide and spacious, with a wall on one side opening to blend the boundaries between indoors and outdoors. 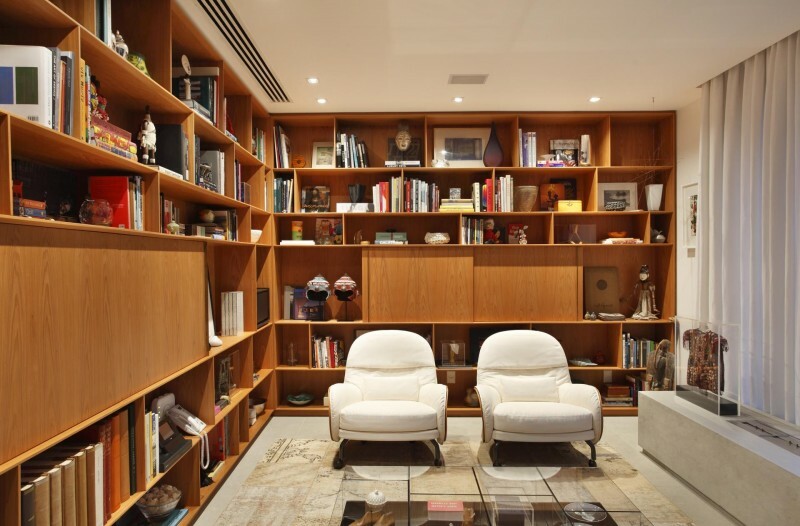 “This Project is a complete refurbishment of a colonial style house in one of the most charming neighborhoods in Rio de Janeiro. 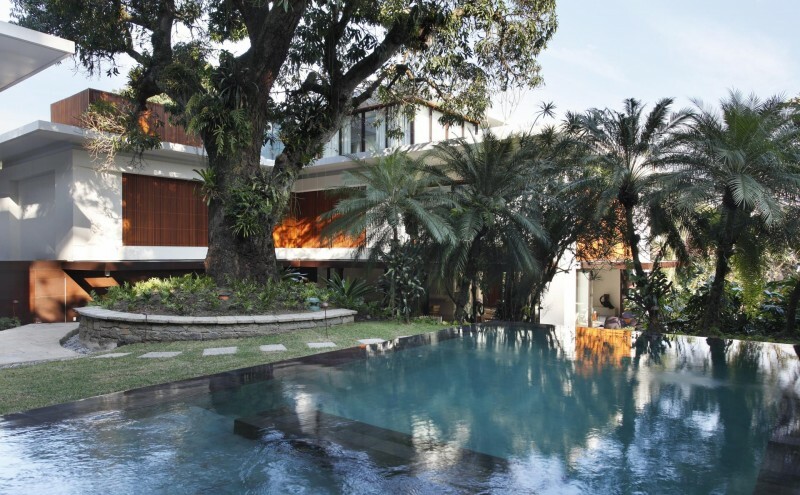 Set on an extraordinary site, full of exotic trees and plants (original landscape plan by the famous landscape architect Burle Marx) it’s a 1500 sq meters house divided in 2 blocks. The main and bigger block is the family’s house. The smaller one accommodates the staff’s rooms, laundry, garage, Home Theater and SPA (the last one directly connected with the outside leisure activities, swimming and the patio). 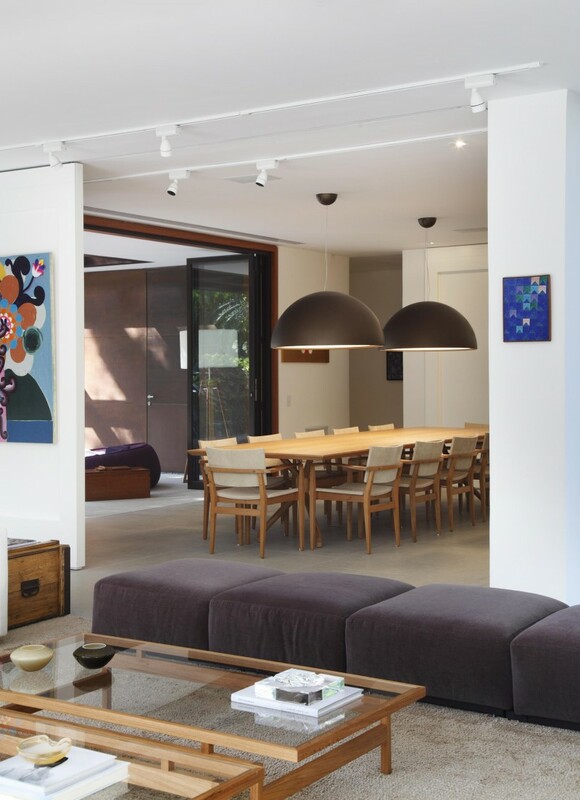 The clients wanted to keep the original dimensions and distribution of the house yet giving it a more contemporary look. Following this principle, all the exterior walls were maintained and the interior ones were demolished and rebuilt with a new layout. The two blocks received new spaces on the top, a home office with a roof garden on the main house (possible after the demolition of the existing tile roof) and an apartment of two bedrooms to attend the staff. 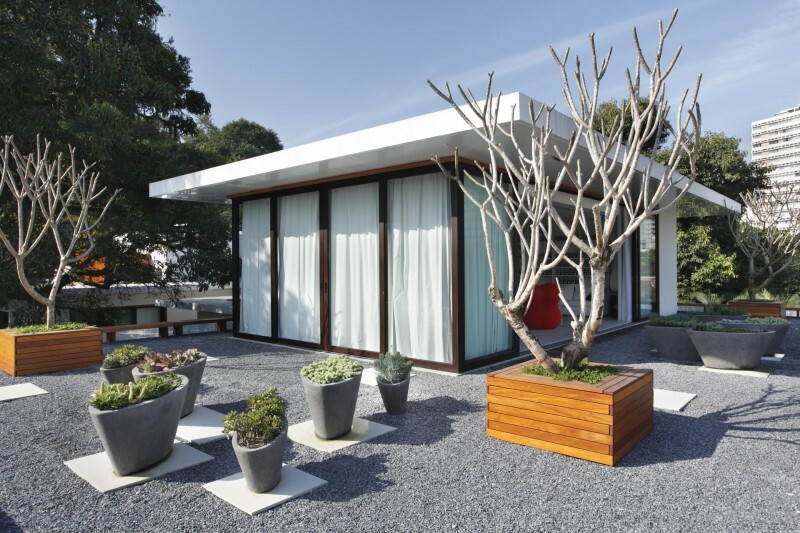 The main goal were to integrate the exterior garden with the interior spaces by opening big windows and doors. In the interior the idea was to create large and clean design spaces with minimum fluent connections. 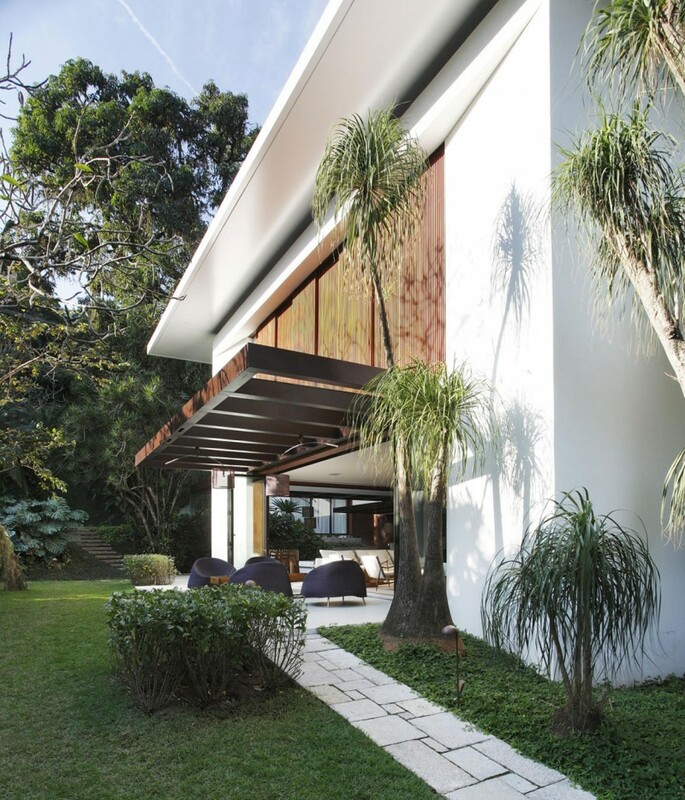 The Brazilian environment also had a big influence on the final aesthetics of the house design, the marvelous climate that allows one to enjoy the exterior spaces all year round, can also get very aggressive with extremely strong rains and hard sun light. 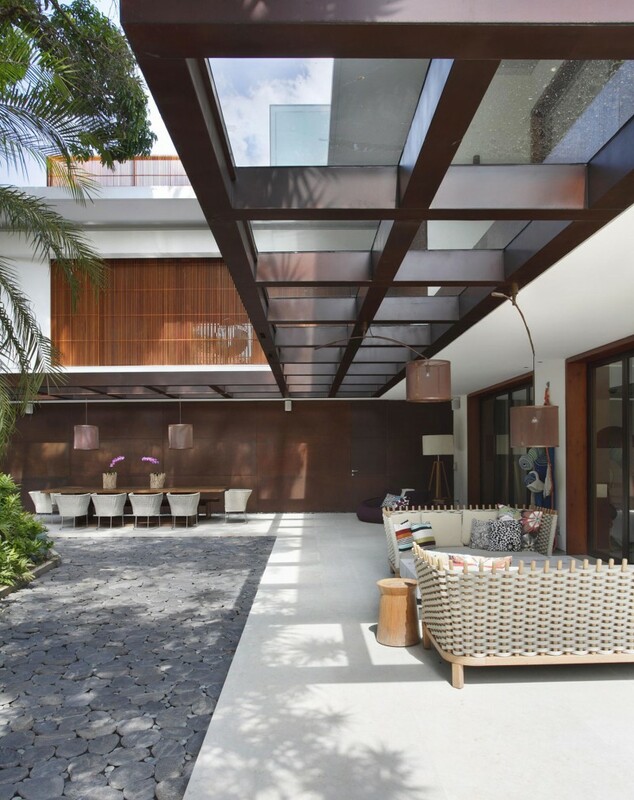 These factors influenced the large canopy all around the house and the wooden exterior slat screens. 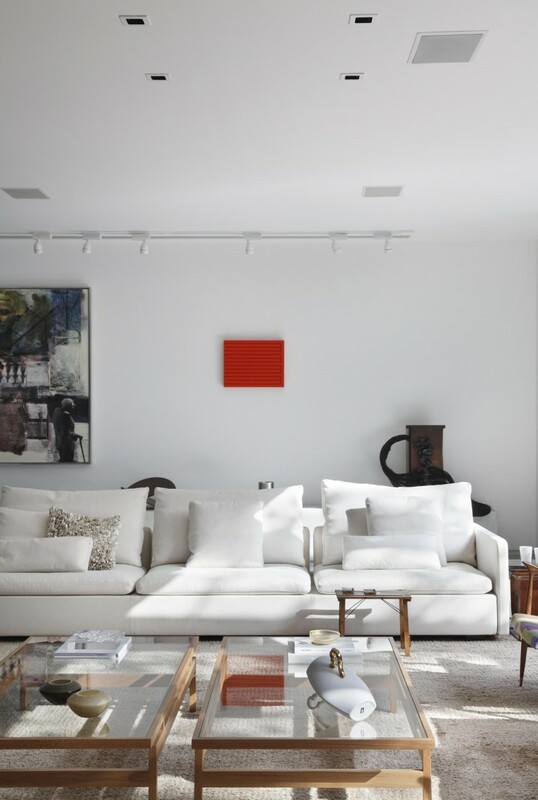 The main entrance,despite maintaining its function and location, changed its role in the distribution of the interior spaces: the space was converted into an art gallery, once the clients have an important national and international art collection. 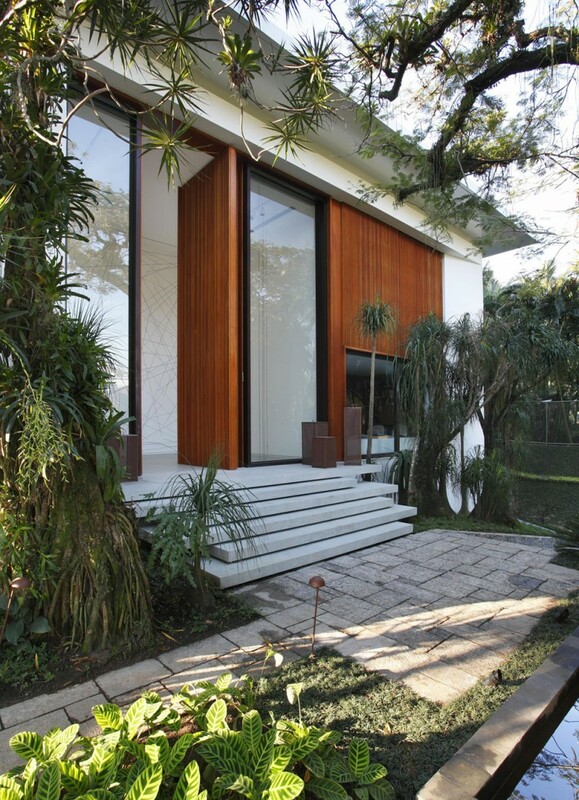 This double height is influenced by one of the most striking elements of the house the 2,20 x 6,20 meters high wooden door. The main connection to the higher floors is now located closer to the kitchen in a more intimate area. 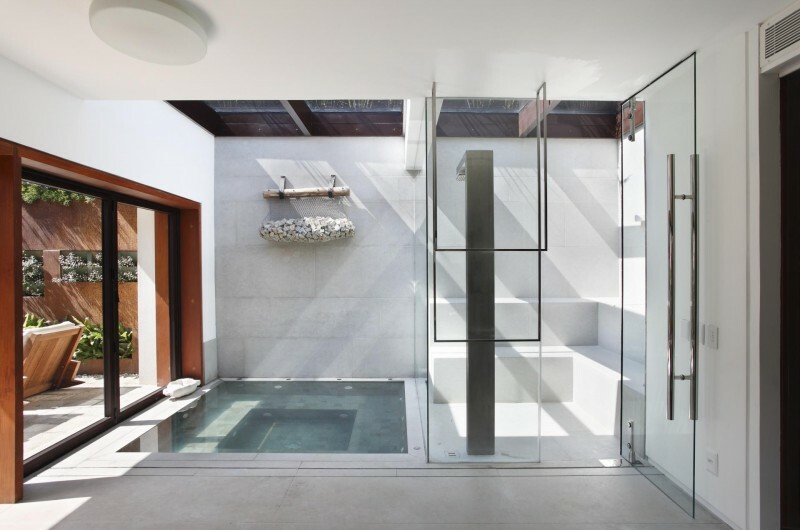 The stairs are made in a corten steel structure that is exposed from the lower side and covered with gray limestone (Baiteg Blue ) above and it is bathed from a glass ceiling with direct light that gives it a sensation of being floating in the air. 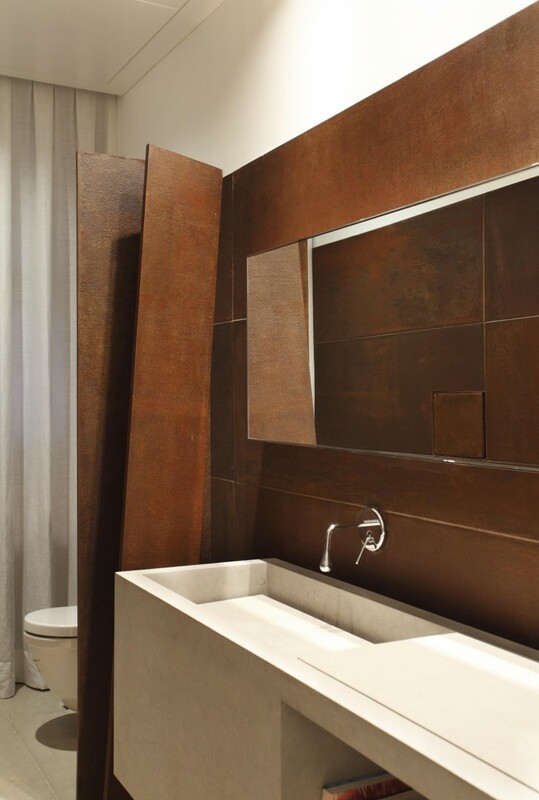 Corten steel was also used on the ground floor restroom covering the walls, were small doors were opened in order to create an austere but playful environment. The small doors were used to expose smaller art pieces. The bedrooms are located on the first floor and connected through a family room. 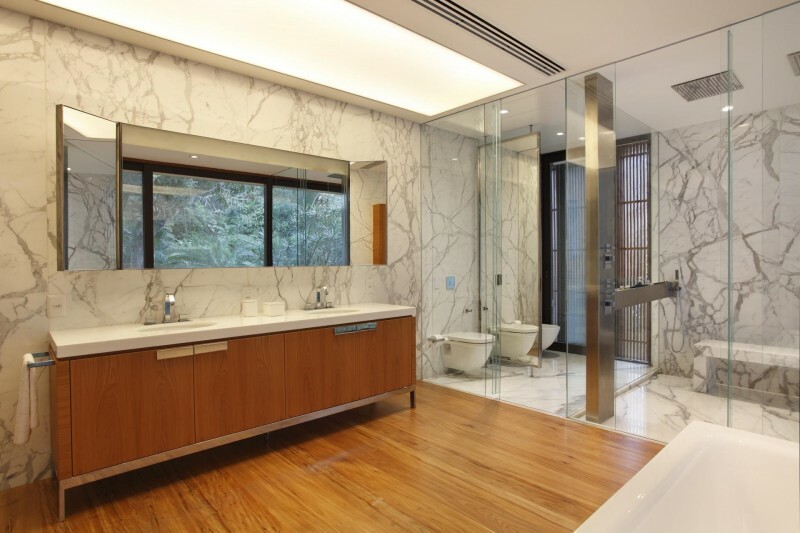 Special attention was given to the master bedroom’s bathroom, where finnier materials, like Statuary marble, was used. Finally, on the 2nd floor, we have the home office space. 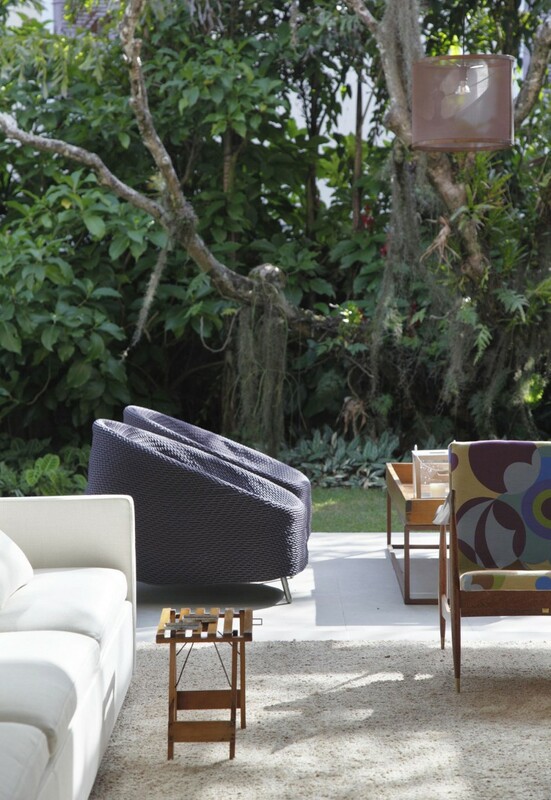 One of the main ideas when this space was created, was to have a glance of the extremely beautiful surroundings with high mountains, covered by tropical vegetation. It was also created a smaller outside area. All the finishings and materials are very high standard, however the image pretended was one of simplicity and homogeneity in order to valorize the art work. Almost all the spaces have Baiteg Blue limestone with the exception for the first floor where it was used peroba do campo wood. 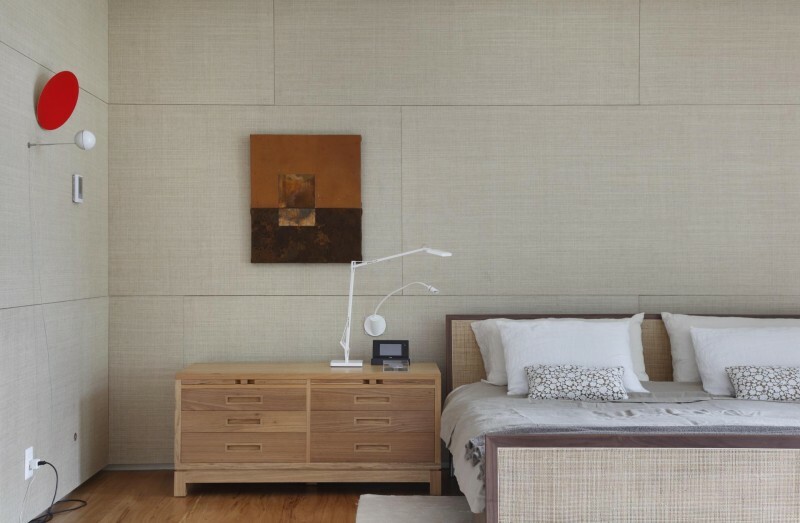 The walls are white and the windows have dark brown aluminum frames. Statuary marble was used on the main bathroom, Nanoglass on the children’s bathrooms. Italian design bathroom accessories.